The photo below was taken in St. Louis, at the celebration of the Silver Jubilee of Ordination of Father Joseph Westhues, at that time the founding pastor of St. Catharine of Alexandria Parish in Riverview Gardens. Front row: Theodore (farmer in Glasgow, MO, 1880-1967), Joseph (Catholic priest, 1884-1938), Fritz (farmer in Glasgow, MO, 1901-1985). 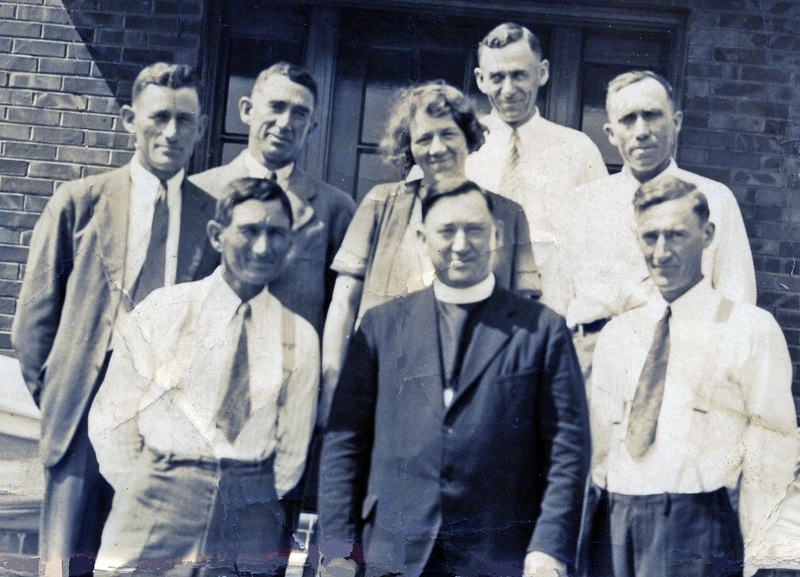 Middle row: John (farmer in Glasgow, MO, 1895-1970), Ben (farmer in Moberly, MO, 1890-1988), Anna Oidtman (grocer in Jefferson City, MO, 1898-1986), William G. (farmer in Glasgow, MO, 1881-1959). Back row: Henry (judge in Jefferson City, MO, 1888-1969). The two children who had died by then were Theresia (1886-1917) and Mary Flaspohler (1893-1934).